A partial denture may be worn to assist with function, but beneath, the bone loss continues. The progression below shows a side view of a human jaw. We can see how a normal, healthy jaw with all teeth present begins to shrink shortly after three extractions. The patient may be fitted with a partial denture to assist with function, but in the absence of teeth roots in the jaw, the bone melts away. Over time the bone loss becomes more extensive from not having teeth and the partial denture becomes loose fitting over the shrinking bone. 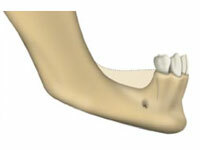 The eventual bone loss can be tremendous, as the bone never stops shrinking. 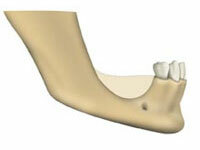 If too much bone is lost, a bone graft may have to be done to build enough bone to support a dental implant. If bone loss is severe, the patient may not be a candidate for implants. 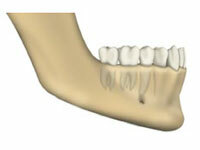 This is why implants should be placed as soon as possible after the loss or extraction of teeth. *In addition to the bone loss that happens beneath a partial denture, as the partial becomes looser, the clasps on the surrounding teeth that are holding the denture can become loose from all of the pressure. If you would like to replace your uncomfortable dentures with beautiful, permanent dental implants, schedule a consultation with one of our highly skilled oral surgeons. He will evaluate your jaw, teeth and gum structures to determine whether you are a dental implants NYC candidate. As some of the most accomplished periodontists, they can also help you improve the health and appearance of your gums. To set up you individual consultation, call us today.